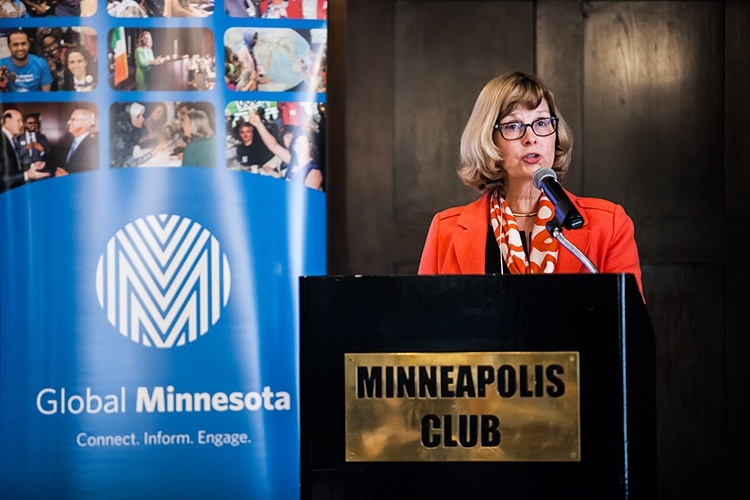 Global Minnesota announces that after 21 years of leadership, Carol Engebretson Byrne will step down from her role as president in January 2019. Under Byrne’s leadership, Global Minnesota has created groundbreaking programs on important international topics, engaging tens of thousands in Minnesota to know more about the world. The organization has financially grown by more than 300 percent and has experienced transformational change with Byrne at the helm, including increased outreach to the community, more free programs to remove barriers to expert insights on key foreign policy issues, the initiation of a robust corporate membership program, a move to a new facility, and the organization’s rebrand and name change to ensure its vital mission remains relevant for future generations. Byrne’s departure will mark the end of an important time for the organization, which has only had five presidents or executive directors throughout its 65-year history of work in advancing international understanding and knowledge in Minnesota. “I am privileged to have served as a steward of the worthy mission of this amazing organization that makes such a positive difference in our community and world,” Byrne said. The Global Minnesota Board of Directors has engaged Ballinger|Leafblad, an executive search firm with extensive experience in the nonprofit sector, to conduct a national search. More details will be available soon on our website and in upcoming communications.